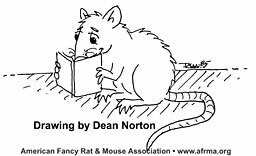 Here is where you will find information on the care of Rats and Mice. We have taken this information from our newsletters and flyers. Zoonotic Rodent Diseases - Rat Bite Fever - by Carmen Jane Booth, D.V.M., Ph.D. The Quest - How to find the rat or mouse for you! Rat and Mouse Essentials! - 10 Things You Need Before Buying a Rat or Mouse! These are posters that we use at our displays and have had people asking for copies. These are in PDF format and are ready to hand out in classrooms, etc., that you can print to your printer. More posters that we use at our displays. These are in PDF format and are ready to hand out or use in displays that you can print to your printer.